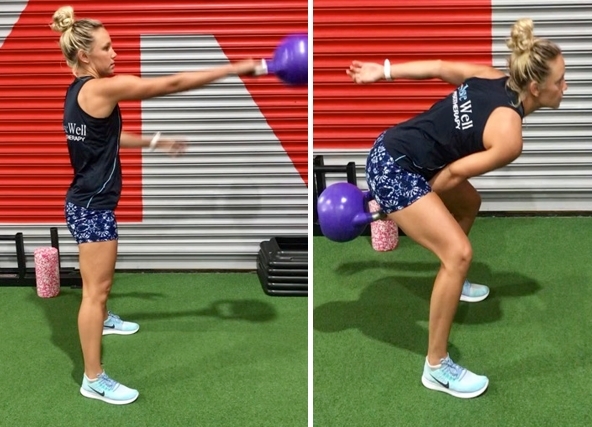 As simple as the KB swing is- it will still target your entire trunk. Choose a KB that is the correct weight for you (you should feel challenged but you should be able to complete the workout with this weight). Stand over the KB with feet hip-width apart. Place a Foam Roller behind you, this will help you with the backswing- if you hit the foam roller over you are swinging the weight too far back. Squat down, grip the KB with palms facing you. Driving through your heels, explode through hips to send weight swinging upward from the quads. Aim for chest height, with arms extended. Contract your core and glutes throughout the exercise. Keep back straight. 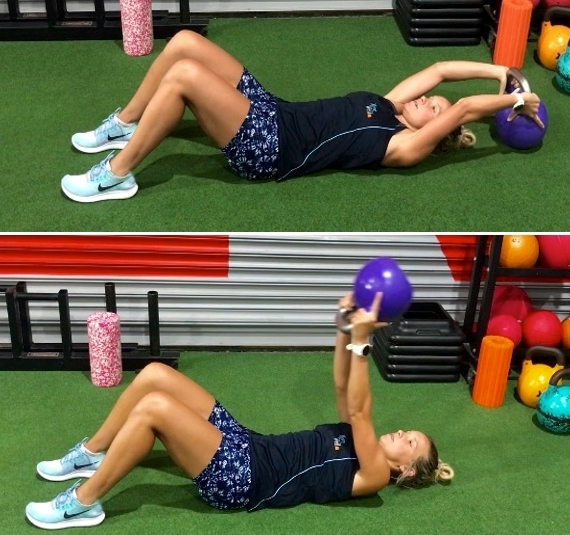 Hold a KB overhead and lie flat on your back.Keeping your legs together, lift them up off of the ground and then lower them just before your heels touch the ground. Make sure that your back is not rounded. This intense plank variation will get your ABS firing! Begin in a plank position, hands beneath your shoulders, with your legs in a wide shoulder width stance. Place KB just in front of your hands. 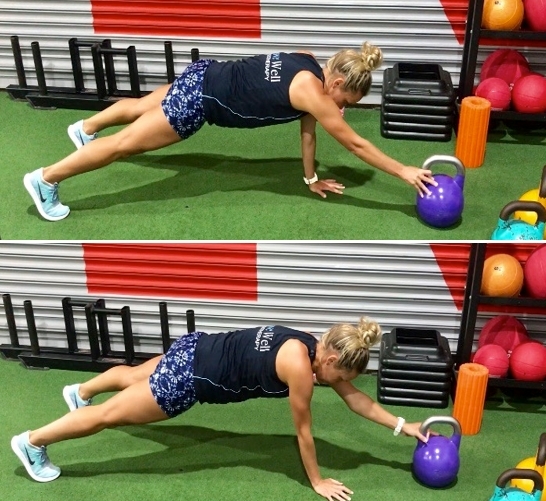 Reach for the KB with your left hand, keeping your abs tight and push it forwards. Then pull the KB back with your left arm back to starting position. Repeat the same movement with your right arm. You can also perform this exercise with straight legs. This exercise is a great stabilizing exercise and will work your entire abs. Begin by lying on your back with your knees bent and feet flat on the floor. DO NOT ARCH YOUR BACK. Press the KB above your chest, keeping your arms straight and then bring it back down behind your head. Hold the KB overhead. Lie flat on your back and keep your legs out straight. Keep your arms straight and then sit-up, make sure that you keep your back straight. Slowly, lower yourself back into starting position. Make sure that you are sliding back down as if you were sliding one vertebrae down at once. Sit on the ground and place the handle of the KB over the front of your foot. Make sure that the weight is not too heavy for you to lift. Lie flat on your back, make sure that your back is not rounded. Pull the weight up by bringing your knee towards your chest, pause and then straighten your leg again without touching the ground. Place a KB in front of you. The aim of this exercise is not to touch the KB. Once you are in a comfortable position, keep your legs out in front of you- you will move your legs from right-left over the KB touching the ground with your heels and then lifting your feet back up over the KB to do the same on the other side. Anchor a resistance band to a bench, attaching the KB to the resistance band. Fold your legs and lift them up off of the ground. Now twist and pull the KB to your right side. The resistance of the band will try and pull you towards where it is anchored to, so keep your abdominals tight throughout the exercise. WELL DONE – NOW REPEAT KB CIRCUIT SO COMPLETED TWICE!